General Comments: Very simular in features and appearance to the Chet Atkins 6121 with solid body 13 1/4 inches wide. The color of the 6130 roundup is usually more brown and less orange (compared to a 6121), but this is not always the case. Also on all these models (6130, 6121, etc. ), the body is really not solid. 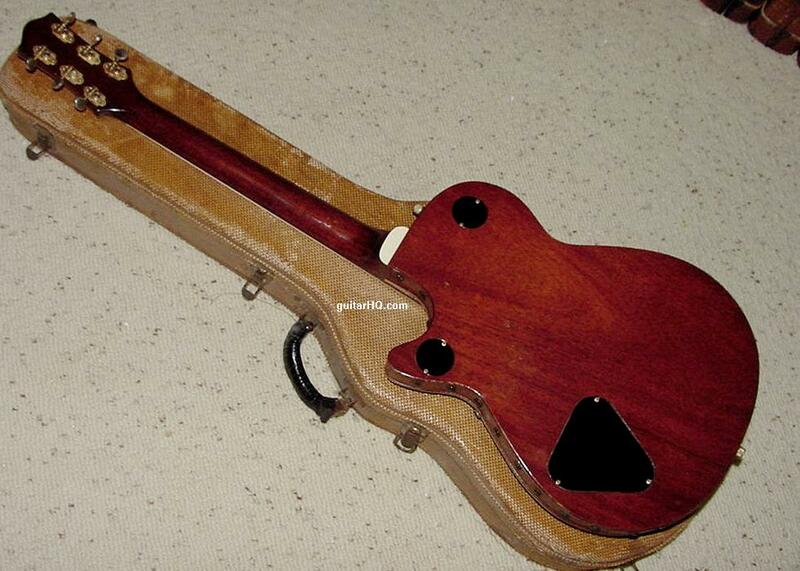 Yet Gretsch called this series of guitars a "solidbody". 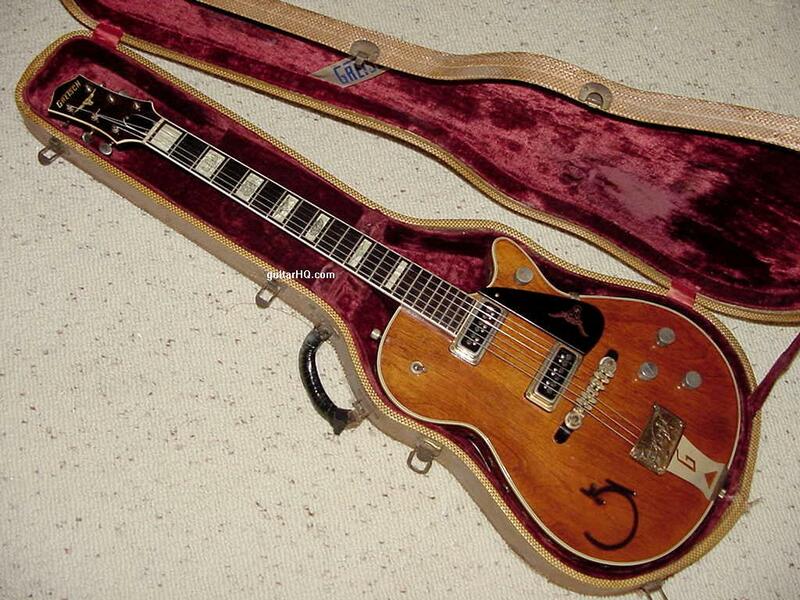 The Gretsch 6130 has knotty pine top or mahogany (instead of maple on 6121) was introduced in late 1953. It had a western "belt buckle" tailpiece (instead of Bigsby on a 6121), Melita bridge (instead of aluminum bridge), tortoise pickguard with engraved steer head, and a bone nut (instead of an aluminum nut). Models late 1953 to 1955 have full "cowboy" attributes including the cow and cactus fingerboard inlays, cowboy belt buckle tailpiece, "G" brand, and leather cowboy tooling around the body, making them very unique Americana guitars. By late 1955 the Grestch 6130 was gone, replaced by the new 6121 Chet Atkin model. Basically the 6121 model made the 6130 redundant, so the Gretsch 6130 model was deleted. In 1957, a batch of Gretsch 6130 models was made. Why this happened is unknown. But the 6130 was made in late 1953 to 1955, none made in 1956, a single batch in 1957, and then no other 6130 models were made in 1958 or later. 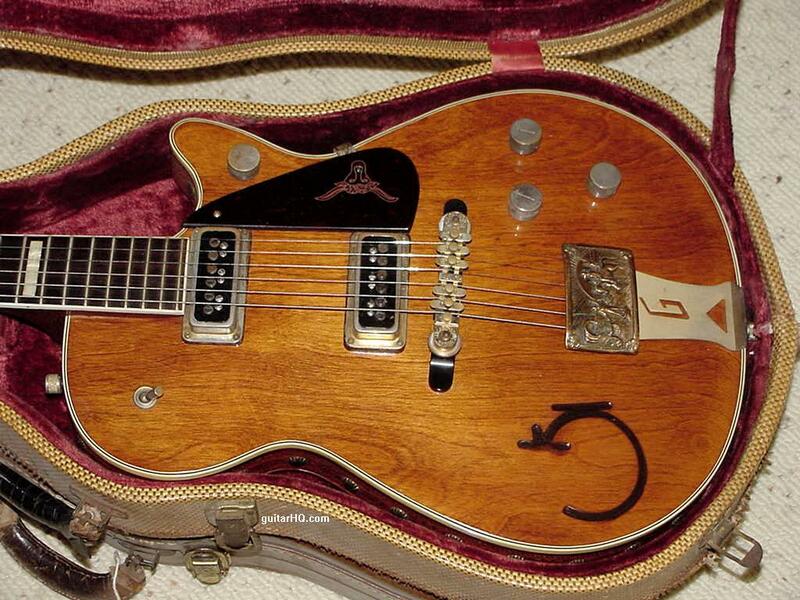 The Gretsch Chet Atkins 6121 solidbody was very similar to the Gretsch 6130 Round up. The differences included a maple top on the 6121 (knotty pine or mahogany on the 6130), orange top finish on the 6121 (the 6130 generally had a more brownish top finish), a metal aluminum nut on the 6121 (bone or plastic nut on the 6130), and a Bigsby vibrato on the Chet Atkins 6121 (western "belt buckle" tailpiece on the 6130). 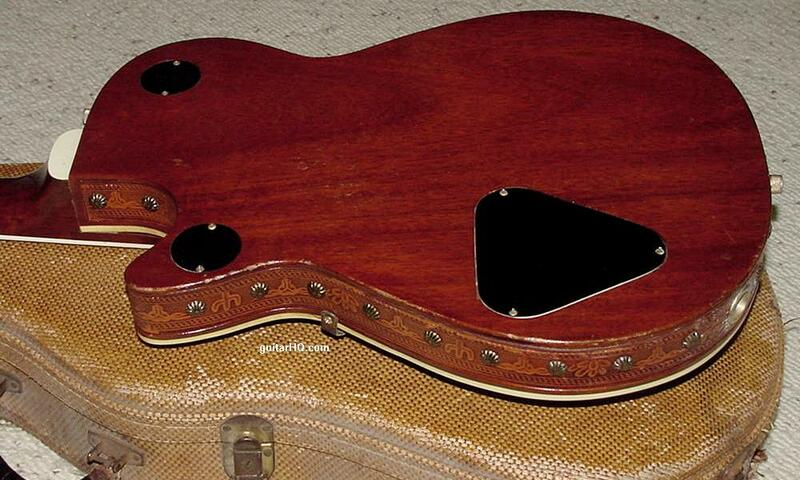 In 1957 the inlays changed to humptop inlays on both models). The Gretsch Chet Atkins 6121 stayed in production until 1963 (unlike the Roundup 6130 that stopped production in the 1950s). Hence in 1961 the Chet Atkins 6121 became a double cutaway model, and in 1962 got a standby switch. The 6121 was discontinued in 1963. If you need to figure out the exact year of your Gretsch Roundup 6130 guitar or Chet Atkins 6121 solidbody guitar, use the serial number from the serial/model number label. This is located inside the body in one one of the rear control cavities. See the Gretsch Serial Number Info web page for help determining the exact year. Single Cutaway, body finished in Amber Red, Orange, or Mahogony Brown. Two DeArmond single coil pickups. Three knobs on lower bout, one on cutaway, 1 switch on upper bout. Tortoise pickguard with engraved steerhead. Sides covered with wester-motif tooled leather. Celluloid block inlays with engraved cows and cactus. Model made with these specs until discontinued in late 1955 due to the 6121 model's similarities. One batch of 6130 guitars made in 1957. Truss rod cover was bulbish (happened with all Gretsch models in early 1956). 1955 Gretsch Roundup 6130 guitar with a mahogany top and knotty pine peghead face.